Guiding You Through Your Case. I'll Be With You Every Step of the Way! I felt better just knowing I had someone in my corner. He were very responsive to my calls and questions, and his fee was very reasonable. I would recommend him to anyone of my friends or family that needed representation. James M., Runnemede, NJ. 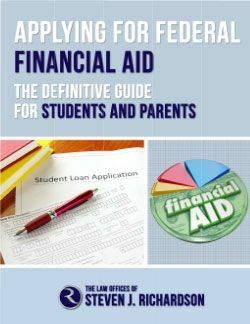 Overwhelmed by the financial aid process? Want to be sure you make informed choices? Then you need this book! Applying for financial aid for college? Need information to help make the right choices? Then get this FREE book download! Debt Collectors Calling Constantly? Creditors Suing You Here in NJ? Get This Book to Know Your Rights and Fight Back! Being hounded by debt collectors? Are creditors suing you? Has your bank account been levied or wages garnished? Find out what to do from this free book! 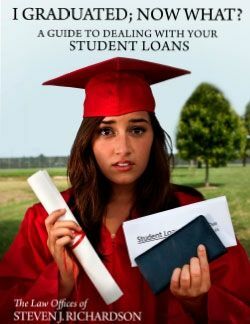 Don't Know What to Do About Your Student Loans? Then You Need This Book! Can't pay your student loans? Need to get out of default or get an affordable payment plan? Then get this free book from Woodbury, NJ lawyer Steve Richardson. 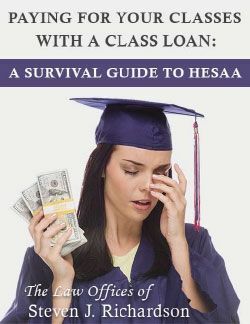 Getting Sued by HESAA Because You Can't Pay Your NJ CLASS Student Loan? Stressed Out Because Co-Signing Family Members Are Being Sucked In With You? Then Get the Book That Tells You What to Do to Fix Things for Yourself and Your Family! Getting sued by HESAA because you can't pay your NJ CLASS Student Loan? Facing stress from cosigning family members? Then get the free book with the answers! Debt Collectors Calling Constantly? Creditors Suing You? Get This Book to Find Out If You Need to File Bankruptcy. Creditors after you? In too deep and drowning in debt? 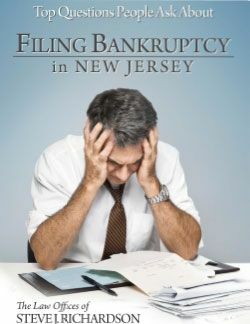 Get this free book from Woodbury, NJ lawyer Steve Richardson to find out if you need to file bankruptcy. Arrested for Drunk Driving in Southern NJ? Then You Need This Book! 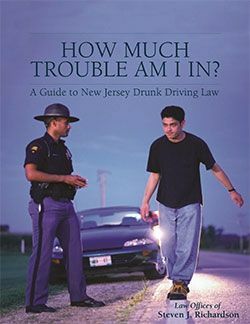 Did you get a ticket in southern New Jersey for DUI? Do you have questions? 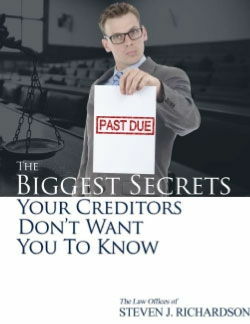 Then you need to get this free book from Woodbury attorney Steve Richardson. Getting a Divorce in New Jersey? Have Questions About Bankruptcy? Then You Need This Book! 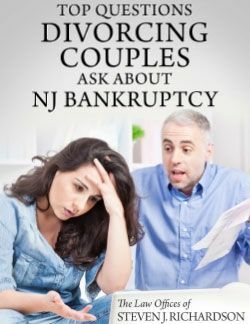 Getting divorced in NJ and thinking of filing bankruptcy for marital debt? Your spouse filed bankruptcy? Get the answers you need from this free book. Get a Traffic Ticket in Southern New Jersey? Then You Need This Book! 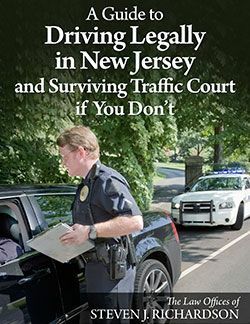 Defensive driving in NJ includes knowing the rules of the road & how to avoid getting a ticket. This free book tells toy how to avoid, or survive, getting one. Thinking About Bankruptcy? Have Lots of Questions? Download This Book to Get the Answers! 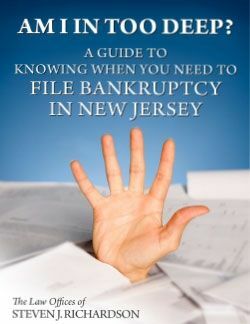 Steve Richardson’s free book “Top Questions People Ask About Filing Bankruptcy in New Jersey” is an excellent way to get the answers to your questions. Has Your NJ Bank Account Been Levied? Do You Need Money Unfrozen to Pay Your Bills? Then You Need This Survival Kit! Has a creditor levied on your New Jersey bank account? Do you need the money back to pay bills? 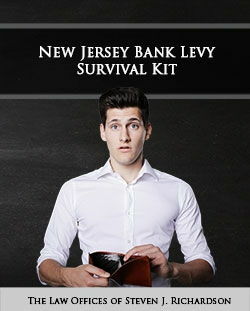 Then you need this free survival kit! 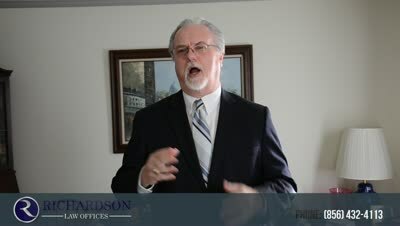 New Jersey Lawyer Builds Informative Website In this video clip, NJ lawyer Steve Richardson talks about his website and how it helps people with bankruptcy, DUI, traffic tickets, and student loans. Out of State Drivers Should Not Ignore NJ Traffic Tickets Did you get a traffic ticket in NJ but ignored it and went home? Find out what can happen to you and why that's a bad idea! Is REPAYE the Best Payment Plan for Your Federal Student Loan? Looking for another repayment option for your federal student loans? Then consider whether REPAYE is right for you! Trust Fund Taxes Do Not Get Discharged in Bankruptcy If you own a business and need to file bankruptcy on it or yourself, be careful about trust fund taxes. Find out why they can't be discharged! Why Working Under Table Can Cause Problems For NJ Bankruptcy Are you considering bankruptcy but working under the table with your employer? Then find out how your "off the books" job could hurt your chances of filing! How Not Carrying a Credit Card Balance Could Hurt Your Credit Do you pay off your credit card balances every month? That might be hurting your credit score! Find out why! Why You Cannot Be Arrested for Failing to Pay a Debt in NJ Has a debt collector threatened to have you arrested if you do not pay? Find out why, if you live in NJ, that collector is lying to you, and what you can do! 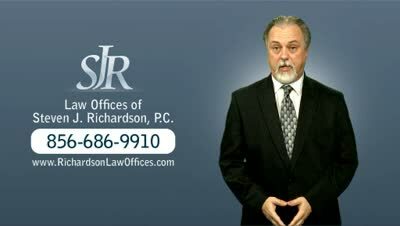 Approachable, experienced and knowledgeable, Woodbury attorney Steven J. Richardson will make a big difference in your New Jersey bankruptcy, traffic ticket, student loan or DUI case. Get the Help You Need to Deal with the Problems You Are Facing! You are probably here because something is happening in your life that is disrupting it and causing you stress. You need information on what you can do about it, and perhaps an experienced person to be your guide through the process. You might be facing a mountain of debt, considering bankruptcy, and looking for a bankruptcy lawyer. You might be being pursued by a creditor who is threatening to levy on your bank account or garnish your wages, at a loss as to how you will ever pay back your student loans, facing the loss of your home to foreclosure, or looking at the loss of your driver’s license due to a drunk driving DUI charge or other traffic ticket. Is there anything I can do to solve this? Do I need a lawyer, or can I handle it myself? Your first step should be to check out the information on this website. I have used my knowledge and experience as a New Jersey attorney to put together a variety of articles, FAQs, blog posts, news and other resources for people just like you who need help dealing with a problem in your life. Then, if you live in Southern New Jersey, already know that you want or need help, that this isn’t the sort of thing that you are comfortable handling on your own, and have decided that you need to take action, then your second step is to call me to schedule an appointment! Contact me today to ease the stress, mark this problem DONE, and get on with your life! You need to act now; the longer you wait, the fewer options may be available! Stop the pain. All you need to do to get started is to call me at 856-432-4113! 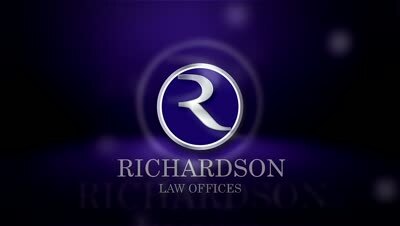 Why trust attorney Steven J. Richardson? When you call me, you get professional advice from a New Jersey lawyer with over 25 years of experience representing clients in bankruptcy and traffic court cases in Gloucester, Camden, Salem and surrounding counties. My considerable expertise on bankruptcy, debt relief and traffic violations in New Jersey, combined with an intimate knowledge of Camden, Salem and Gloucester county courts allows me to take full advantage of the law to alleviate your burden. 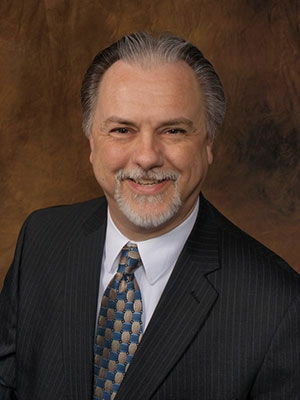 In Woodbury, Gloucester County I have been a source of sound legal advice for the local community in matters of bankruptcy, foreclosures, creditor collection, student loans, traffic violations and DWI/DUI for over 20 years. I will explain your legal options and consequences, and will aggressively fight to protect your rights. Whether you are an individual or a business owner, I welcome you for a consultation in my Woodbury Law Office. Call today at 856-432-4113 or contact me to schedule an appointment.